Well, my sister and I just returned from a six day trip to Portland. It has been almost five years since we have travelled together so it was a very nice little adventure. Arriving in Portland, we were very excited with the prospect of seeing great quilts, taking longarm quilting classes, and seeing if the vendors might have something I needed to spend my money on to buy. (Of course, I always find something with the vendors). I was also excited to be able to see my son. He lives in Portland, so it is always a double bonus to be able to spend a little time with him. He took us to the Rose Garden that was still full of roses, even at the end of October. He took us to a great mansion that overlooked the city and had a great view of Mt. Hood. Sorry I have not written the last couple of weeks. Life sometimes gets in the way and I get so busy in the studio. I finished several pieces and have started others but forgot to take pictures to share with you. I have been working out the surface design for this one the last couple of days. I am very sure it is going to be a fun one. I also received this one yesterday. The colors are a great palette of greens, browns, and rust oranges. Many times a simple design is so pleasing. 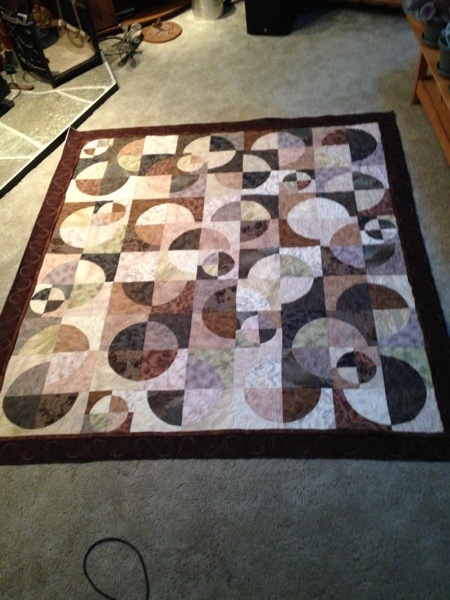 This one is such a quilt, simpler design by quite pleasing. I went to a quilting “talk” over the weekend and they discussed the possibilities of nine patch blocks in quilts. Now I have been fascinated with the nine patch for many years. This is a quilt that I made using two different sized nine patch blocks. I sewed and sewed and sewed to get this critter made. Afterward, I thought I would never make a nine patch quilt again. I was finally cured. Or so I thought. Seems that the nine patch pops up over and over in quilt ideas. Maybe it is because it is a traditional quilt block. I think tradition is important in life. It gives you a great foundation to build upon. Maybe it is because it can be very versatile. Being versatile gives you the possibility to have different outlooks on different things. It definitely can be changed by the color placement and we all know that it is the colors of our world that helps bright each day. This is another nine patch quilt I made (in fact, I made two of them). It was much easier to make than the uneven nine patch quilt. Must have been because it was my original pattern and not someone else’s pattern. So what is with the saying “I am spread too thin”? I think it should be ” I am spread too thick”! I sometimes feel like that piece of toast with the peanut butter and jelly oozing off the edges. I have errands, projects, garden, clubs/group, yard work, want to, have to, need to, should do stuff, stuff, stuff, and more stuff. Doesn’t that feel like the peanut butter and jelly is dripping off the edges? That is definitely not “spread too thin”. Several years ago, a friend passed out Angel Cards with a word printed on each of them. My word was Abundance. At the quilt guild, the program person handed out strips of paper and suggested that each of us make a quilt that represented the word written on the piece of paper. My word was Abundance. I am blessed and have an abundance of love, joy, support, friends, and have way too much peanut butter and jelly. I am Completely Spread Too Thick. I wouldn’t want it any other way. Doesn’t it seem like we are always running in circles? I think that our lives can get all knotted up and then we are not able to go with the flow. (Reminds me of quilting some days). When that happens, stop and take a breath. Today I have that same long list of things to do, so I’m ignoring everything, taking a breath, and quilting. Funny that this piece is circles. Guess I am getting the message loud and clear to stop running in circles. The colors in this quilt are so soft and soothing. I love this quilt. It would be great if my client would let me keep it. Serenity is the name of this collection of fabrics. How fitting. 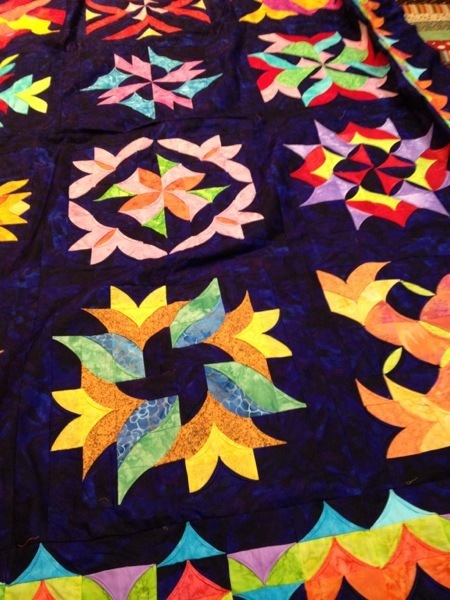 I spent my morning “going with the flow” as the feathers and swirls just floated across the surface of the quilt. I am feeling much more relaxed and ready to face the day. Maybe circles are not as bad as I thought. Maybe it just has to do with that passion thing of quilting. Choose to do something every day that involves your passion. It certainly is much more enjoyable than running in circles.